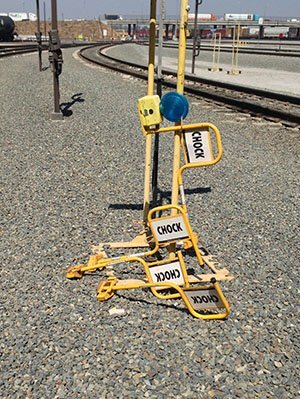 Wheel Chock Stand - Blue Steel Co., Inc.
Safety Chocks are designed for safety but, left lying on the ground become a tripping hazard. Blue Steel Wheel Chock Stand. OSHA 1910.30(a), 1910.176, 1910.178(K) and 1910.261 require wheel chocks to be used for safety. 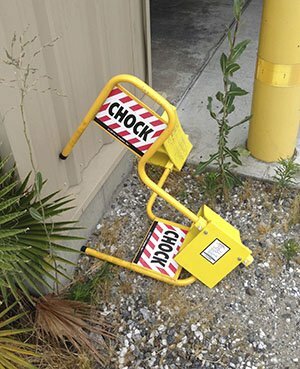 Be certain you don’t create a slip or trip hazard in the process with our Wheel Chock Storage Rack. Steel angle and tubing frame, with a zinc rich primer and Safety Yellow Powdercoated finish. Rubber foam to protect against damage to the vinyl sign. 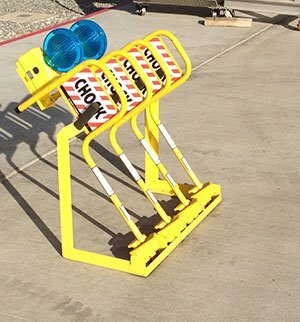 Blue Steel Wheel Chock Stands offer a safe storage solution and follow the 5S philosophy. Equipment safely stored where you need them. 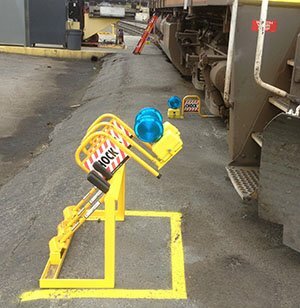 Safety organizes your wheel chocks at needed locations in the railyard. To inquire about our Wheel Chock Stands.